Deraeocoris brevis piceatus often is the most abundant predaceous true bug found in Pacific Northwest apple and pear orchards. Where insecticides are used judiciously, it can have a major impact on a variety of pests. Most organophosphate insecticides are highly toxic to deraeocoris adults and nymphs when applied directly, but older residues of these chemicals are only moderately toxic. Other spray compounds such as insect growth regulators and oils are not very toxic. Deraeocoris adults and nymphs prey on many species including spider mites, aphids, leafhoppers and scale insects and are considered to be a very important predator of pear psylla. The egg is elongate and is inserted into plant tissue. Only a small part of the egg is visible. During summer, eggs are most often laid in the leaf midrib. The nymph is a mottled whitish gray, with long gray hairs on the thorax and abdomen, and a cottony-looking secretion covers much of the body. Dark area on the thorax and abdomen give it a spotted appearance. The eyes are dull red. Deraeocoris adults are shiny black and 1/8 to 1/4 inch (3-6 mm) long. 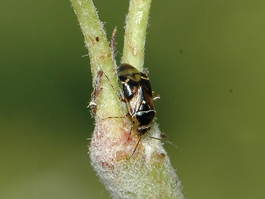 Deraeocoris overwinters as adults, both in and outside orchards. Overwintering females lay eggs in April or May. Nymphs of the first generation are found 2 to 3 weeks later. They pass through five instars. A second generation is produced in most areas of the Pacific Northwest. Under laboratory conditions, development from first instar to adult takes about 25 days at 70°F. During that time, a single Deraeocoris nymph can eat as many as 400 pear psylla eggs or nymphs. Deraeocoris can be monitored by the beating tray method, but predator-prey relationships have yet to be established to help decide when densities are sufficient to ensure biological control. Deraeocoris is often abundant in a variety of non-orchard habitats in the Pacific Northwest. Other vegetation that is known to provide food and shelter for this predator includes service tree, tobacco brush, mountain mahogany, white fir, madrona, black oak, manzanita and several species of pine. Deraeocoris adults are most likely to colonize orchards where woodland or wild habitat is close by. 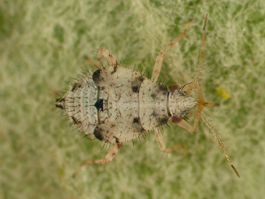 Maintaining unsprayed vegetation close to the orchard may play an important role in the natural control of orchard pests by this mirid.